The movies have a lot to do with what type of parties the kids want. Thanks to recent movies Guardians of Ga Hoole, many parents are looking for owl party supplies. Fortunately, merchants usually keep up with the latest popular shows and manufacture party supplies accordingly. So a quick search online or possibly at a local store, can have parents ready to give their kids the desired party. If it has been a while since the movie, supplies may be harder to find, but there are still plenty of party supplies that feature owls. So one can still have feathered friends at their party. A Pinata is popular at children’s parties. Children love to be rewarded for insanely wacking something to pieces. However, many of the guests and parents have been injured by a blind folded young person swinging a big stick. So one can get a pull string pinata. With these kids take turns pulling a string, or they pull them all at one and the candy falls out. This is not quite as thrilling as doing battle with the old-fashioned type, but more simple and safe. Babies, well actually parents, might like owl plates that say “Look Whoo’s one” at a party. 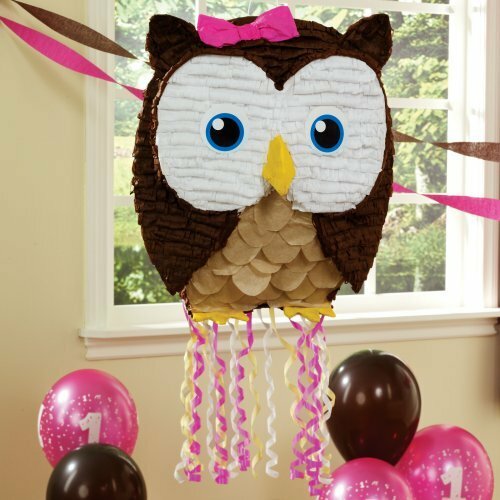 The toddler would likely love owl balloons. When you think of these birds of the night, know they are not just used for birthday celebrations. If you get the decorations that look more like the real animal, instead of cute and cartoony, then you can use them for a Halloween party. These birds have really sharp talons and beaks. Their eyes look big, piercing, and predatory. People can be grateful they are not mice in its stare. There are a lot of decorations that have owls with pumpkins or that hang on stings and appear to be flying. One can even get a really creepy looking black one, with red eyes. Owl party supplies are great for nature theme parties, as well as parties for children, or spooky Halloween parties. They are neat looking birds, that we, who are not nocturnal, rarely see in real life.